Four Or Five Crazee Guys note Appearing as the characters from the Nick Danger series of sketches. Left to right: Philip Proctor as Rocky Rococo, Peter Bergman as Lieutenant Bradshaw, Phil Austin as Nick Danger, and David Ossman as Dan Catherwood. 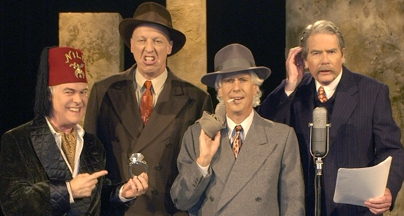 The Firesign Theatre (sometimes credited as The Firesign Theater) is an American comedy group; its members are (left to right) Philip Proctor, the late Peter Bergman, the late Phil Austin, and David Ossman. Their albums parody the usual radio and comedy album tropes. After working briefly in local radio in the 1960s, they started releasing albums in 1968, debuting with Waiting for the Electrician or Someone Like Him and followed in successive years by How Can You Be in Two Places at Once When You're Not Anywhere at All? ; Don't Crush That Dwarf, Hand Me the Pliers, I Think We're All Bozos on This Bus and others. Their comedy was based around improvisation and surrealism, with a touch of social commentary buried deep below the surface. Many of their longer pieces seem to be set in a bizarre and somewhat darker Alternate Universe that still somehow manages to bear a direct relevance to our own. They also made several movies, including J-Men Forever, and Nick Danger: The Case of the Missing Yolk (a sequel to "The Further Adventures of Nick Danger" from the album How Can You Be in Two Places at Once When You're Not Anywhere at All?). You can learn more about them at their website . Alternate Universe: Many of their sketches  especially the whole of Don't Crush That Dwarf, Hand Me The Pliers  seem to take place in a world that's about six degrees closer to a twisted counterpart of 1984 than our own is. The Backwards Я: The cover of their LP How Can You Be In Two Places at Once When You're Not Anywhere at All?, with its "All Hail Marx and Lennon" poster. Bullet Dancing: Done in "Temporarily Humboldt County", from the album Waiting for the Electician: someone fires a gun (presumably) at a native American Indian's feet. 'Let's see the war dance, yeah *bang* dance dance'. Cloud Cuckoolander: All of them. Continuity Nod: Out there, somewhere, there is a Firesign Theatre fan who is making a life's labour of love out of laying out the Theatre's huge and intricate web of in-jokes and self-/meta-/self-meta-references. It's in the water! That's why it's yellow! Prisoner: At first I used an ink composed in parts of me own blood, but when I found that it would not make a suitable carbon I acquired an electric typewriter. Culture Police: "Le Trente-Huit Cunegonde", on Waiting for the Electrician or Someone Like Him, describes a hippie-run future where drug use and rebellion are rigorously enforced by the Establishment. Curse of the Ancients: In the episode of "Mark Time" heard on the Dear Friends recording, Dr. Technical says "Dad ding blast it to blazes! ... If I could just get this dad blame water pump to turn over." Dawson Casting: Parodied on Don't Crush That Dwarf, Hand Me the Pliers, when high school hero Porgie's best friend, Mudhead, admits he's 30 years old. Deadly Game: "Beat the Reaper", "Stab from the Past"
Disney Owns This Trope: The album Give Me Immortality... Or Give Me Death! has repeated promos from "U.S. Plus": "We own the idea... of America." Toward the end of the play they're announcing "We own the idea... of the idea of America." Funny Aneurysm Moment: On the 1980 album Fighting Clowns they have a song called "Reagan" which includes the line "and it's never too late to lose again". This song was later released as a single, with, as its B-side, a song called, "Carter", where they talk about Jimmy Carter winning re-election, then being followed by eight years of Mondale. Funny Background Event: It often pays to try and listen for what's going on in the background. Gag Dub: Their most successful film project, 1979's J-Men Forever, took several '30s serials about catching spies and criminals and turned them into the adventures of a federal agency fighting for, among other things, our God-given rights to smoke dope and enjoy non-rock music. Dad: Where is Porgie, anyhow? Mom: He's upstairs, helping Porcelain make the bed. Porcelain: Oh, Porgie! Oh my, oh my, oh my! Mom: (off) Porgie! Porgie Tirebiter! Porgie: C... c... c... coming, Mother! This opening sequence is a very direct parody of the opening of the 1940s radio/TV show The Aldrich Family. "It's like in the Army, you know? The great prince issues commands, founds states, vests families with fiefs. Inferior people should not be employed." - Nick Danger, from the album How Can You Be In Two Places At Once When You're Not Anywhere At All? This is a hexagram from the I Ching. Another example would be things such as the cover art for Don't Crush That Dwarf, Hand Me the Pliers ◊. They are done up as their respective astrological signs, which are all "Fire Signs". Hardboiled Detective: Nick Danger is a parody of one. Historical Character Confusion: All hail Marx and Lennon! Hostile Show Takeover: Briefly attempted by Young Guy's Battle Butler, Rotonoto, in "Young Guy Motor Detective Radio Prison". Hemlock Stones: No no no, Piltdown, old man — you might as well ask who's behind the Giant Rat of Sumatra. Dr. John Flotsam: Oh, very well, Stones, whose behind IS the Giant Rat of Sumatra? Stones: (Beat) Damn, you're fats, Waller . Stones: (quickly) Er, fast, Fatson. Immoral Reality Show: Waiting for the Electrician (or Someone Like Him), has a segment with a game show called "Beat the Reaper", where participants are injected with deadly diseases, and must guess the disease from the symptoms before it kills them. Injun Country: "Temporarily Humboldt County"
Young Guy: <bad Japanese accent> Justa keepin' it still for a minute, you name "Brad" Shaw, what "Brad" stand for? Young Guy: Oh my God, you George Bernard Shaw! Famous author and writterwrary smart guy! Rotonoto: I see, Boss! "Brad" Shaw say many times, he on side of right! Lt. Bradshaw: <angry> That's right! Larynx Dissonance: Being all men, they do male and female characters. Some of the female ones, especially those voiced by Phil Austin, are downright eerie. Listeners Are Geniuses: A core value of their comedy. Long Title: Most of their albums, although most notably How Can You Be In Two Places At Once When You're Not Anywhere At All? Mathematician's Answer: "Where're you from?" "Nairobi, ma'am. Isn't everybody?" Medicine Show: On the album Everything You Know Is Wrong, the recording's narrator plays a wire recording of a medicine show featuring a "Dr. Firesign" promoting "Chief Dancing Knockout's Pyramid Pushover Paste" and "Don Bruhaha 's Inca Hell-Oil Tonic". Mighty Whitey: Lampshaded in the movie-within-an-album "High School Madness" on Don't Touch That Dwarf, Hand Me the Pliers. After the school disappears, a bunch of Latino students arrive out of nowhere and ask Porgie for advice because he's a white man and will know exactly what to do, leaving his buddy, Mudhead, to wonder "where did all these Mexicans come from?" Mr. Smith: In the bizarre side one skit from the album How Can You Be in Two Places at Once, When You're Not Anywhere at All, the central character finds himself in the lobby of a motel. The desk clerk gives him a card to fill out, but it's already been written in. He chuckles "Well, I couldn't get you to believe my name is 'Mr. and Mrs. John Smith', could I?" The clerk cheerily replies "Of course you could - nice to have you with us, Mr. and Mrs. Smith!" He goes by 'Mr. and Mrs. John Smith' for the rest of the album. Mushroom Samba: In W.C. Fields Forever, listeners are guided through a utopian hippie commune. Pretty much everyone can be assumed to be on drugs here, but the only one overtly taking them is Tiny Dr. Tim, Keeper of the Sacred Tablets (here, have a tablet). When a horse enters the scene ◊ he exclaims "Whoah! Nice paisley horsie! Give the nice paisley horsie some sugar cubes!" The horse runs off trumpeting like an elephant. Painting the Medium: They painted, remodeled, knocked out windows, and added aluminum siding to the fourth wall. Most of the Theatre's work was recorded in the specially constructed Fourth Wall Annex, which was M.C. Escher's only known foray into architectural design. Parody: Practically the defining value of their work. Their commercial for Bear Whiz Beer, from Everything You Know is Wrong, is considered a classic: "As my daddy says, 'son, it's in the water—that's why it's yellow'"
Boobie Chew is a hormone-filled gum that's supposed to make your breasts grow. "Even works for men!" How Can You Be in Two Places at Once When You're Not Anywhere at All? opens with an ad for Ralph Spoilsport Motors, which then segues into a customer arriving to buy a just-mentioned vehicle and driving off. Psycho Electro: "The Electrician", most prominently featured in "Hemlock Stones and the Tale of the Giant Rat of Sumatra". The Electrician notably fails to appear in their first album, Waiting For The Electrician Or Someone Like Him. "I'm The Electrician, and the world is my oyster! Except for the months with an "R" in them!" Red Herring: Invoked/Parodied in "The Tale of the Giant Rat of Sumatra" when Stones and Dr. Flotsam show Violet Dudley the parcel they retrieved down at the docks: "nothing but a tin of red herrings in heavy oil!" Self-Parody: Young Guy Motor Detective Which is a Shoddy Knockoff Product presentation of Nick Danger. Shout-Out: Numerous, often buried in parody. For instance, the quote under Getting Crap Past the Radar is a reference to movie/radio character Henry Aldrich; Once an Episode his mother would call him  "Henry, Henry Aldrich!"  and in a voice cracking with adolescence he'd respond, "Coming, Mother!" The entirety of By the Light of the Silvery, the original theatrical version of what became The Giant Rat of Sumatra, is a Shout Out to The Goon Show. Show Within a Show: Nearly half of Don't Crush That Dwarf, Hand Me the Pliers is the soundtrack of "High School Madness", a mythical teen movie made during an equally mythical version of the 1940s and/or 1950s. Another quarter is the soundtrack of the mythical Korean War and/or Vietnam War movie "Babes In Khaki"/"Parallel Hell!". Much of the rest is snippets of various TV shows "overheard" while a character is channel-surfing. Beulah Belle: Think of those balls you'll have! Dad: You're too young to think about that, Beulah Balls. Er, Belle. Take That! : A sly one to The Residents in Give Me Immortality or Give Me Death with the "Guys in Eyeball Hats", described as "Mumbling, Millenial Morons"
Title Confusion: How Can You Be in Two Places at Once When You're Not Anywhere at All is often referred to as All Hail Marx and Lennon due to the artwork on the cover. Title Drop: The main character of How Can You Be in Two Places at Once, When You're Not Anywhere at All sings the title to himself as he drives his new car. Token Minority: Lampshaded with the Mexican students in "High School Madness". See Mighty Whitey above. What's a Secret Four: Don't Crush That Dwarf, Hand Me the Pliers is full of all kinds of apparently random throwaway details that give a bizarre dystopian Zeerust feel to the setting of its action. Word Salad Title: Most of their albums and tracks have these. "Young Guy Motor Detective Radio Prison" parodies the supposed Japanese penchant for such titles. Like many of the Japanese examples, there's a fairly straightforward explanation ("Radio Prison" is the episode title) that it's more entertaining to ignore.